Yep, IAD is killing the Mobile Lounges soon as part of the D2 project. They're being replaced by a train, just like every other big American airport has these days. 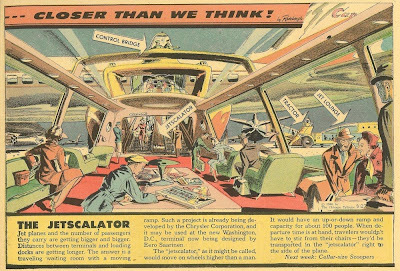 They're rarely if ever used in the original manner, anyway--in which the Mobile Lounge directly docks with the plane. Ever since the midfield terminals were built, the Mobile Lounges are just shuttles from the Saarinen terminal to the other terminals, where you use a conventional jetway. The train's going to make them superfluous even for that. The early ones came in different varieties; some had ramps (not escalators) that tilted up and docked with the plane, and others could jack their whole bodies up to different heights. They functioned as a sort of mobile holding pen back then, and you would sometimes have to wait in there for quite a while. I hope that one in the Radebaugh drawing has a powerful air conditioner. The real ones got uncomfortably hot inside when they sat out in the middle of the tarmac in a Virginia summer, and they had pretty small windows, not a huge glass canopy. ...Hmmm, the Wikipedia page on Dulles says that some "plane mate" lounges are in fact still in use (especially for international flights), and will be used into the future. It's the lounges that go between terminals that are being phased out. I should have mentioned that there's already an underground moving walkway to one of the closer concourses.